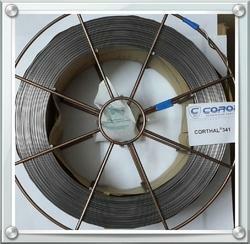 We are a leading Importer of Corthal 341 Welding Wire or Equivalent from Delhi, India. Corthal 341 G Welding Wire or Equivalent is a special developed flux-cored wire electrode high- temperature resistant buffer layers and repair welding for strength. The weld metal is ductile, crack-free and machinable. Welding of buffer layers with high strength at roller presses.